Riotoro Morpheus GTX100 is a fascinating new case design. You can either configure it to be a space-saving ATX cubical (mini-tower) case, or enlarge it by sliding and locking the top half along rails, to convert it to an ATX mid-tower. 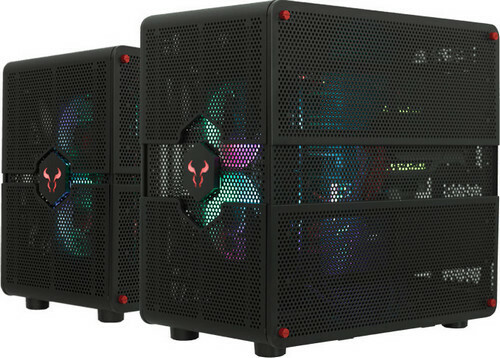 The case features a vertically partitioned dual-chamber layout, with the motherboard tray located in the larger left-side half, and oriented upside down, BTX style. When contracted to mini-tower proportions, the left chamber with the motherboard tray has room for standard ATX (and smaller) motherboards, up to three graphics cards that can be as long as 40 cm, CPU coolers up to 18 cm in height; while the right chamber holds two each 3.5-inch and 2.5-inch drive bays, besides the PSU bay, with up to 22 cm clearance. When expanded to mid-tower proportions, you get more of everything – the left chamber now holds E-ATX motherboards and up to four 40 cm long graphics cards; while the right chamber holds four 2.5-inch bays instead of two. In both modes, the ventilation remains largely unchanged, with two 140 mm front intakes, two 140 mm bottom intakes, two 140 mm top exhausts, and an 80 mm rear exhaust. The top, bottom, and front mounts are arranged in a way to support 280 mm x 140 mm radiators, each, and each mount supports smaller 120 mm fans. Front panel connectivity includes two USB 3.1 type-C ports (standard header), two USB 3.1 type-A ports, HDA jacks, and controls for the case’s in-built RGB lighting controller.